Robin K. Curtis’s practice focuses on all aspects of complex technology litigation, from pre-filing investigation through appellate review. She has worked on numerous patent infringement, trademark and trade secret litigation cases. Robin has worked on matters involving a variety of technologies, including cellular phone user interface and operating systems, CMOS image sensors, biometrics, multiple encryption methodologies, mobile ad hoc networking (MANET), network traffic management, and other wireless and telecommunications technologies covering WiFi, 802.11 and 3GPP standards. Robin has argued at claim construction and evidentiary hearings, managed case teams and discovery, and has taken and defended numerous depositions. She has also conducted pre-acquisition due diligence and advised global clients on intellectual property related considerations in mergers and acquisitions. Robin is also committed to serving the needs of underprivileged individuals who cannot afford legal representation. 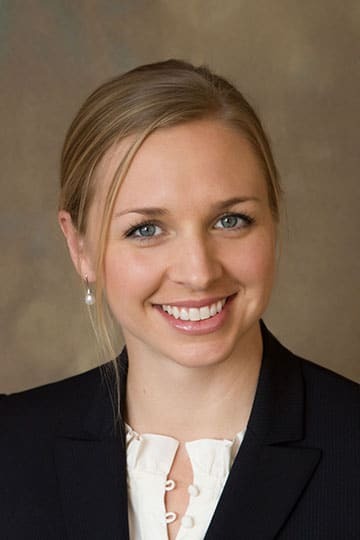 In law school, she earned pro bono recognition for her volunteer work in New Orleans, where she assisted individuals struggling with legal battles over housing in the aftermath of Katrina. Since she began practicing in 2010, she has dedicated hundreds of hours of free legal services to help obtain asylum for a domestic violence victim. She was able to effectively advocate that extraordinary circumstances warranted the waiver of the legal one-year bar to asylum. Robin served as an Extern for the Honorable Susan Illston in the United States District Court for the Northern District of California. Robin summited Mt. Shasta four days before she took (and passed) the California State Bar Exam. She lives with her family in the Sierra Foothills where she enjoys the year-round outdoor activities available, including skiing, hiking, and camping (mostly in the summer months, though sleeping in underground snow caves makes for a fun adventure). Duckhorn Wine Company v. Hill Wine Company LLC. Represented Duckhorn Wine Company in a trademark infringement matter related to Duckhorn’s famous duck-related marks. Secured confidential settlement in the early stages of litigation to effectively minimize attorney fees and costs. Duckhorn Wine Company v. Duck Commander Inc. Represented Duckhorn Wine Company in a trademark infringement matter against a much larger Napa Valley winery and Duck Commander (of Duck Dynasty fame). Secured confidential settlement in the early stages of litigation to ensure future protection of Duckhorn’s famous duck-related marks. Sherman & Associates v. ASM. Represented involuntary plaintiff and patent owner, ASM, in securing dismissal of patent infringement suit brought by licensee on procedural grounds. The dismissal was affirmed on appeal.